The Owner finds the Environmental Trust Escrow at closing. Funds released based on achievement of project milestones. 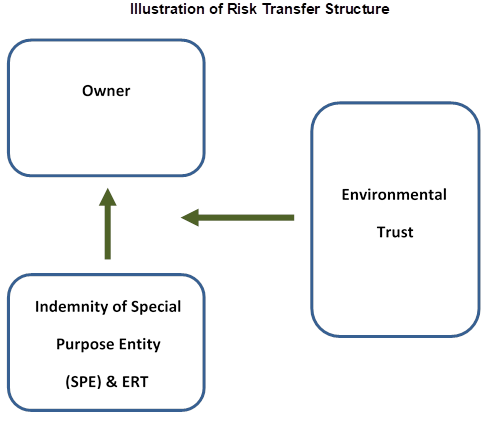 SPE/ERT would indemnify the Owner for environmental liabilities. The insurance would be customized solely for this transaction with the Owner being the First Named Insured. At significant completion, the PLL Insurance will be assigned to the SPE as First Named Insured with the Owner listed as an Additional Insured. If the SPE/ERT indemnity fails, the Excess of Indemnity Insurance will respond for the Owner. Together, the SPE/ERT indemnity, Excess of Indemnity Insurance, and PLL Insurance will cover both known and unknown environmental matters for the Owner.